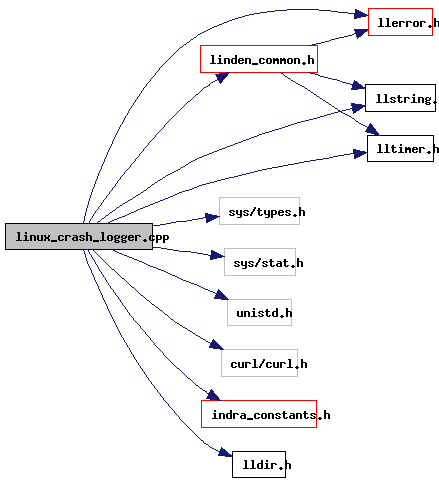 Definition at line 91 of file linux_crash_logger.cpp. References gServerResponse, i, and S32. Definition at line 115 of file linux_crash_logger.cpp. References dialog_text, dialog_title, FALSE, llendl, llinfos, and NULL. Definition at line 551 of file linux_crash_logger.cpp. Definition at line 152 of file linux_crash_logger.cpp. References CRASH_BEHAVIOR_ALWAYS_SEND, CRASH_BEHAVIOR_ASK, curl_download_callback(), do_ask_dialog(), encode_string(), LLFileEncoder::encodeURL(), gCrashInPreviousExec, gDirUtilp, LLDir::getExpandedFilename(), gLaunchTime, gSendReport, gServerResponse, gUserserver, gUserText, i, LLDir::initAppDirs(), LLFileEncoder::isValid(), LL_MAX_PATH, LL_PATH_LOGS, LL_PATH_USER_SETTINGS, llendl, llinfos, LLFileEncoder::mBuf, NULL, S32, and TRUE. "Second Life appears to have crashed.\n"
"This crash reporter collects information about your computer's hardware, operating system, and some Second Life logs, which are used for debugging purposes only.\n"
"This is a third party version of the Second Life viewer provided by Dale Glass.\n"
"It is unsupported by Linden Lab, and reports crashes to daleglass.net.\n"
"Please don't contact Linden Lab for support, IM Dale Glass or send email to\n"
Definition at line 53 of file linux_crash_logger.cpp. Definition at line 64 of file linux_crash_logger.cpp. Definition at line 88 of file linux_crash_logger.cpp. Referenced by LLFileEncoder::LLFileEncoder(), main(), send_crash_report(), and WinMain(). Definition at line 89 of file linux_crash_logger.cpp. Referenced by LLFileEncoder::LLFileEncoder(), and main(). Definition at line 85 of file linux_crash_logger.cpp. Referenced by dialogHandler(), and main(). Definition at line 84 of file linux_crash_logger.cpp. Referenced by curl_download_callback(), and main(). Definition at line 86 of file linux_crash_logger.cpp. Referenced by main(), send_crash_report(), and WinMain(). Definition at line 87 of file linux_crash_logger.cpp. Referenced by dialogHandler(), main(), and send_crash_report().